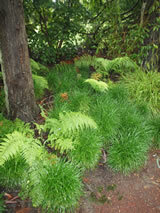 A dense evergreen, low-growing, plant slowly spreading with dark green broad leaves. The small lilac flowers in small clusters in summer are followed by large blue berries which are attractive when found hidden under the foliage. 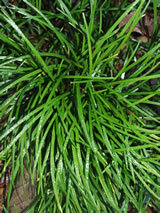 It is slowly spreading via short rhizomes so acts more like a clumping plant. Prefers shade. Lovely planted as an edging or in a pot. We have this currently available in a POT 1.5 & 10 pack containers. Ask for them at your retailer.